Wolf Zbar came to Kingston from Grodna (in present-day Belarus) in 1926. He arrived with his wife Lipka and their two children. Like many Jewish businessmen at the time, Wolf started in the retail business with a peddler’s cart. 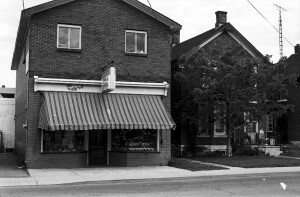 Zbar’s Dry Goods was attached to the family’s Montreal street residence and operated from 1931 to 1960. The Zbar family also ran two other businesses. The Lloyd Clothing Company opened in 1943 on the corner of King Street East and Princess Street, at what is now the location of A-One Clothing Store. It remained there until 1948. After it closed, Lipka Zbar started up Lloyd House Furnishings, also on King Street East. Her involvement with this store lasted one year. Subsequently two Jewish businessmen, Percy Robinson and Maurice Smith, took ownership of the store, and later founded the S&R Department Store. Further up the street, at 294 Montreal, is where Hyman Rosen’s Dry Goods Store was circa 1925.